When Home And Health Are Just Out Of Reach : Shots - Health News Health insurance doesn't pay for housing, but sometimes that is what a patient needs most. A Medicaid experiment helps some elderly and disabled people move out of institutions into their own homes. Donna Giron wheels through the halls of the nursing home she's lived in since May. Finding an affordable home of her own has been difficult. Donna Giron is frail. She has Crohn's disease and uses a wheelchair to get around because walking exhausts her. But she doesn't want to be in the nursing home where she has lived since May. Giron, 65, is looking to rent a small house in the industrial town in the Cleveland suburbs where she grew up. Using federal funds from a special project, thousands of elderly and disabled nursing home residents have been able to move into their own homes in recent years. The experimental project has reached people in 44 states, including more than 5,400 in Ohio. It connects people to the medical and living support they need to move into private homes, so that they can live independently. But often the housing is the sticking point. Giron doesn't have family members who could take her in, so she's house-hunting. As she tours one likely prospect, she manages to get out of her wheelchair to maneuver down some stairs; at the bottom, Giron looks out a window at the front porch and says she can picture herself sitting outside watching the neighborhood. Then, she sees the kitchen. "Oh, we even got a dishwasher! Oh, my goodness gracious. Yeah, I want this one. I want this one," she says, laughing. Despite her health problems, Giron feels out of place in the nursing home, where many residents are older and sicker than she is. "I'm a very independent woman," she says. "I have been for most of my life. I mean, I've had to be." But independence is difficult to achieve. And until recently her health insurance – Medicaid — has been the roadblock. Ohio Medicaid director John McCarthy explains that the federal program that offers health coverage for the poor and disabled is primarily set up to help people live in nursing homes. "It's the housing that's the hard part, because Medicaid will not pay for housing costs, meaning room and board," McCarthy says. "It will only pay for room and board in institutions." If Giron finds a home, she will have to pay rent out of her small pension. But as part of this experimental program, Medicaid will pay for the costs of setting up house: house-hunting, deposits for rent, and the purchasing of household items like furniture. Perhaps most importantly, it provides a transition coordinator to help find the home and connect Giron to services she'll need, such as home health workers. "It is a lot of work," McCarthy says. "These are not easy cases to deal with. It's not like you just find somebody and move them. It takes a lot of time and effort to make this happen." Many in the program are older and disabled like Giron. But most in Ohio are actually younger than 65, often with physical or mental challenges that make finding the right housing particularly difficult. In every category, though, making it possible for these Medicaid recipients to live on their own saves the state and federal government money. McCarthy and his team estimate that the average costs for an individual in the experimental program (which is called Money Follows the Person) is $49,000. 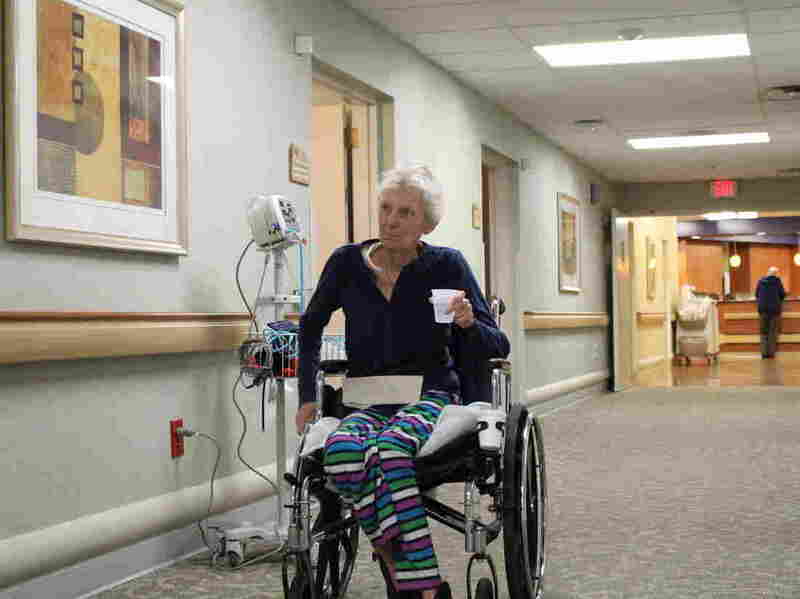 Under traditional Medicaid it costs about $64,000 annually for nursing home care in Ohio. The state's Republican administration believes so strongly in this project that it stepped up efforts to transition people into it three years ago, right after the project was funded again, under the Affordable Care Act. Ohio, Texas and Washington account for 40 percent of the nation's home placements since the federal project began. The program is very popular with beneficiaries, policy makers and even some nursing homes, but there are still two big challenges. For one, funding for the program was extended under the Affordable Care Act in 2010 but is set to expire in September 2016. And, secondly, people like Giron who are waiting to get a home are finding it very difficult to find one that's affordable. "I just want my own place," Giron says. "I don't want anything fancy. I just want something to call my own. I just want to be in my own home. I just want to live my life normally like most people do. I want to be on my own. I want to be happy." She starts to cry. Giron did not end up getting the little, two-story house with the dishwasher. But she did get some good news for the holidays: A few days ago she signed a lease for a different place and is slated to move into the home in January. This story is part of an NPR reporting partnership with WCPN and Kaiser Health News.